Dr. Blobel at Rockefeller University in Manhattan, where he spent nearly all his working life. 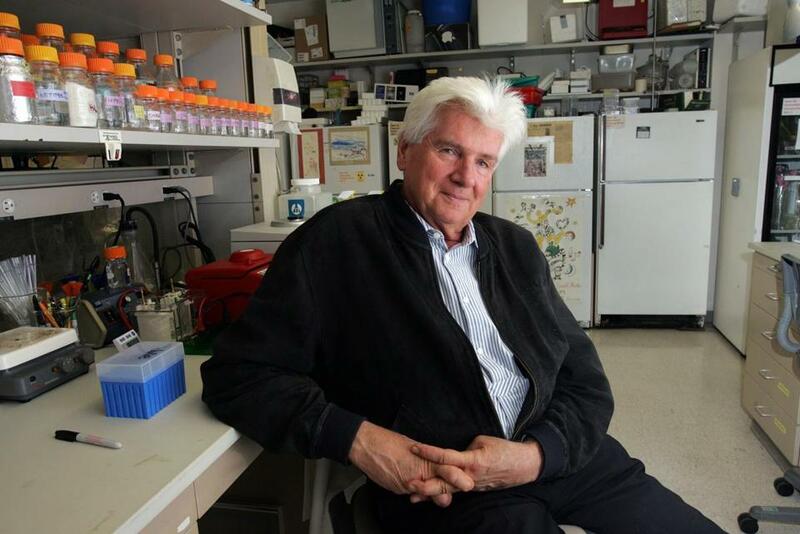 NEW YORK — Günter Blobel, a molecular biologist who was awarded the 1999 Nobel Prize in Medicine for discovering that proteins in any living cell have virtual ZIP codes that guide them to where they can help regulate body tissues, organs, and chemistry, died Sunday in New York. He was 81. A spokeswoman for Rockefeller University in Manhattan, where he had long conducted his research, confirmed his death at New York-Presbyterian Weill Cornell Medical Center, and said the cause was cancer. Because all diseases have a molecular basis, medical experts say, Dr. Blobel’s achievement was a fundamental step on the road to improved health, holding out the promise of understanding the mechanisms behind cystic fibrosis, Alzheimer’s disease, leukemia, schizophrenia, the virus that causes AIDS, and other immune-system deficiencies, hereditary conditions, and cellular aberrations, including cancers. A Silesian-born boy in Nazi Germany during World War II, and later a refugee from postwar communism in East Germany, Dr. Blobel set out to be a physician in America but found himself increasingly drawn to pure research. He spent nearly all his working life at Rockefeller University, what he regarded as the valhalla of research. Like many scientific advances, Dr. Blobel’s had no moment of “Eureka!” It unfolded over 30 years of painstaking, often frustrating, but occasionally thrilling investigation: a process of building on others’ work, intuitive thinking to form new hypotheses, and testing, using the results to modify his theories, and then testing and modifying again and again. Along the way he won many prestigious awards, some for essentially the same insights recognized later by the Nobel committee. Dr. Blobel built on the work of his Rockefeller University mentor, Dr. George E. Palade, a pioneer in using electron microscopes; Palade shared the 1974 Nobel Prize in physiology or medicine, as the award is formally called. Palade’s discoveries about cells’ inner workings, and the functions of cell structures, laid the foundations of modern cell biology, the basis of the biotechnology industry. Dr. Blobel, who joined Palade’s laboratory in 1967, inherited from his scientific forebears the knowledge that each living cell — about 1 quadrillion of them in an adult human body — contains 1 billion protein molecules that are constantly being created inside tiny bladder-like cavities called the endoplasmic reticulum, which is encased in a protective membrane. The mystery Dr. Blobel confronted was how cells control their internal traffic, so that large proteins can get through tightly sealed membranes surrounding their birthplace and then travel to sites within the cell, or even through cell walls on intercellular trips through the body, where they can find specific worksites, called organelles (little organs), and penetrate them to perform assigned tasks. In 1971, Dr. Blobel and a colleague, Dr. David D. Sabatini, who later headed cell biology studies at the New York University School of Medicine, proposed a bold idea known as the “signal hypothesis.” It suggested that each protein carries in its structure a sequence of signals comparable to address tags on airport luggage or ZIP codes on mail to ensure that it all arrives safely. The signals, Dr. Blobel found, are chains of amino acids created by protein-making machines that read distinctive RNA codes and then fix them on each new batch. Günter Blobel was born on May 21, 1936, in the Silesian village of Waltersdorf, then in eastern Germany and later part of Poland. He was one of eight children of Bruno and Margaret Blobel. His father was a veterinarian. The boy and his siblings attended local schools, and in their remote village the family, by his account, was bypassed by World War II until its closing months. As chaos engulfed the crumbling Third Reich, the family was split up among relatives in various villages. After the war, the Blobels settled in Freiberg, in Soviet-occupied East Germany. Günter graduated from high school there in 1954, but, refusing to join a communist youth group, he was labeled “a member of the capitalist classes” and barred from universities. Crossing to West Germany, he studied medicine in Frankfurt, Kiel, and Munich and earned his medical degree at the University of Tubingen in 1960. After two years as a hospital intern in Germany, he decided that medicine was merely treating symptoms and that to get at underlying causes he must devote himself to research. At the time, his brother Hans was on the faculty of the University of Wisconsin on a Fulbright Scholarship. Hans urged him to move to Madison for advanced courses to enhance his chances for a career in medical research. Dr. Blobel did so, and earned a doctorate in oncology at Wisconsin in 1967. He then joined the Rockefeller Institute for Medical Research as a postdoctoral fellow under Palade. He moved steadily up the ladder of Rockefeller University, as assistant professor of cell biology in 1969, associate professor in 1973, and full professor in 1976.